As inbound is becoming one of the most popular strategies in digital marketing, people are naturally turning to the web to learn more about it. 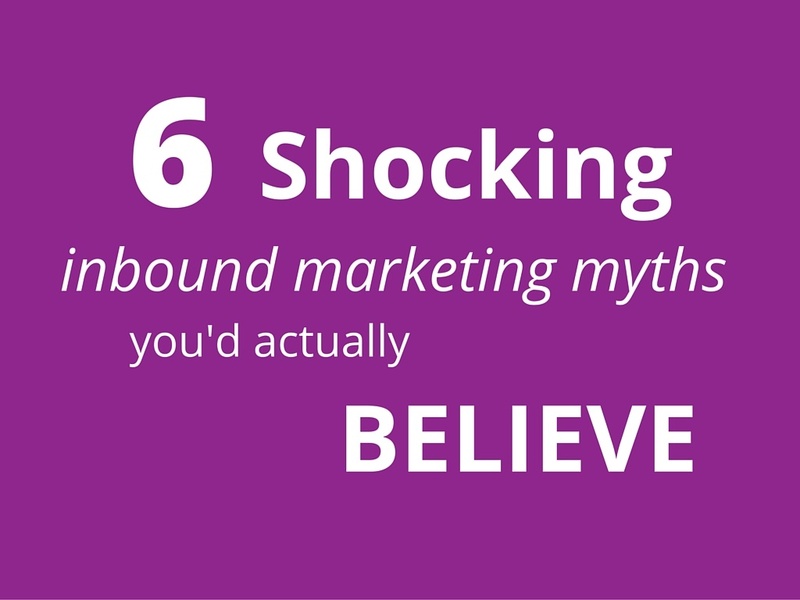 However along with the facts, there are lots of inbound marketing myths. Business owners are missing out on the benefits of inbound because of the false information flying around. So, we've collected a list of the most common inbound marketing myths to get the facts straight. "Inbound consumes more time than it's worth"
Some people are drawn away from inbound because they are looking for a strategy that's quick to setup and gives fast results. A successful inbound plan can take longer than other digital marketing methods - we're not going to lie. As Inbound Marketing focuses on engaging with customers on a personal level, it takes time to research and understand the psychology of your buyer personas. Because you go the extra mile to understand your customers, your inbound strategy will have more of an influential impact on their decision making process. Just like SEO which is a long term strategy, inbound marketing is an investment. When you've created excellent content and it's on your site, it's there forever. It will keep on working to convert people into customers. "You can't measure the ROI of an inbound strategy"
One of the most common myths about Inbound Marketing is that you can't measure your ROI. It almost sounds impossible to effectively track people's activity on your website and counting how many people are converting into customers. But it's easy to measure your ROI on your inbound strategy if you have an intelligent CRM (Customer Relationship Management). With a CRM like Hubspot, you can easily observe your strategy to see what tactics work and what don't. "Inbound is just about blogging"
Because inbound marketing relies on content, some people believe all you have to do is set up a blog and that will start bringing the customers in. There is much more to inbound than just an awesome blog. The presence of inbound can be found on your website pages and in other forms of content like eBooks, downloadable templates and even your content on social media. Secondary to this, the strategies and tools to capture data and nurture individuals beyond their first touch is where Inbound really starts to shine. For your strategy to work you have to implement it in all the areas of your marketing plan. "There is no strategy when it comes to inbound"
If you think that's true then it's likely you've had a bad experience with inbound. Any inbound strategy is carefully thought out. As inbound marketers, we have targets we want to achieve and we regularly analyse to see what methods work. It's all about understanding what customers engage with and what encourages them along the Buyer's Journey. "Inbound is just about writing broad content for the masses"
As the inbound methodology relies on creating high quality content, some people presume the content will be read by all types of customers. Well, that's not true. Each form of inbound content we create has to have an ideal customer in mind. As inbound marketers, we work to understand the psychology of the different types of customer coming to your business so we can create varied kinds of content that will engage with your different buyer personas. At the inbound conference we visited in 2015, we listened to an informative keynote speech by Brene Brown who claimed we can only create content that engages with customers if we understand their vunerabilities and behaviour. Inbound Marketing isn't about blindly typing away on the keyboard, there is a method! "Inbound is just for small businesses because they can't afford outbound"
Because outbound advertising methods like television adverts and ads in a newspaper are so expensive, there is a common perception that small businesses go to Inbound because it's cheaper. Well in fact more and more large businesses are adopting inbound techniques. 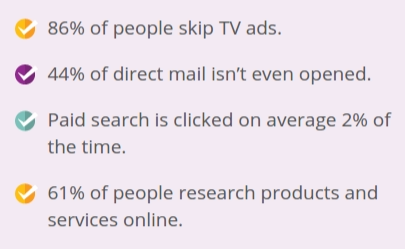 Marketing has changed and outbound techniques aren't as successful as they used to be. All businesses have had to adapt in order to create successful marketing tactics. The inbound methodology works to capture people's attention and engage with the reader's needs rather than cold advertising. More businesses are using inbound to get visitors to their sites. We can see how larger companies are investing in their blogs, creating downloadable content and engaging more on social media. Want to learn more about inbound marketing? Download our FREE eBook to find out why businesses are going inbound today. Or if you want to find out how inbound marketing can benefit your business, request a a call from us and we can discuss how an inbound strategy can get you more leads and more sales. What other inbound marketing myths do you know? Share them in the comments below and we might add them to our list!